Need a fun and whimsical splash of color in your child's nursery or playroom?! I found the perfect decorative touch! Today I finally removed Ella's mobile from her crib. Yeah, I know, she's 13 months old and hasn't used it in months...I just never got around to taking it down. Well yesterday she disassembled it during naptime so I knew it was time! 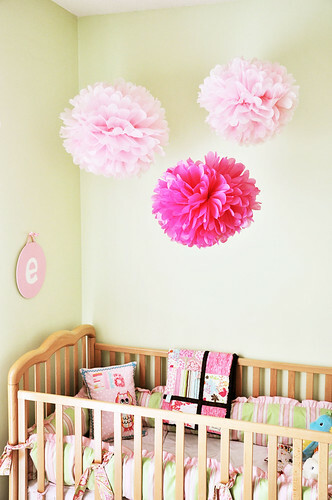 I still want her to have something fun to look at when she's lying in her bed so today I put up these beautiful pink tissue paper pom-poms! These were incredibly easy to make and super cheap! I bought these at Walmart for $7 for a set of 5 but they are only available in the pink/fuschia/red color pack.... however, do not fret, here is a great tutorial to make your own in ANY color to match your child's room! Don't be scared, it's SUPER easy!! You can't mess it up! Don't you just love how sweet these look?! They really soften up the space and pull everything together at the same time! I made the crib bumpers, baby quilt, and letter plaque last year when Ella was born. The pillow is a recent addition that I won a couple weeks ago through a blog giveaway from this sweet shop! I hope these photos give you the motivation to make some for your sweet ones! If you do decide to make them please let me know. I'd love to see your finished pom-poms! P.S. These would also be perfect for that next birthday party or hang white ones for beautiful inexpensive wedding decor!! Those are so cute! What a great idea! I'll have to do that in my girls' room. We just recently moved them into the same room, and it's a bit bare! Thanks for the idea! Ella's room is SO cute!! These are darling! I love how they look above the crib. So very sweet!!!!! oooh, thanks for sharing - those look like a fun project! I've been trying to come up with some cute and cheap decor ideas for a nursery. I love the way these look!